Winter Passages is Robert Brustein's nineteenth book of criticism. It includes his considerations of culture and politics over the past four years of American life, demonstrating how the imperfections of the government and economy have plunged the country into an artistic winter in which there is a troubling lack of support for, and understanding of, America's arts and artists. 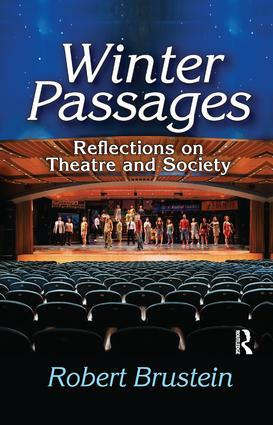 In a section on "Cultural Passages," Brustein includes chapters on compromised theatre institutions, auteur productions, the American musical, generational idiosyncrasies, and China's growing theatre culture, which contrasts with American culture. The second section, "Dramatic Passages," addresses twenty-seven great playwrights from Aeschylus to August Wilson and demonstrates how they have influenced our sense of history and human character. In "Laudatory Passages," Brustein discusses great American artists, living and dead, who continue to influence our sense of self as a nation and as individuals. Brustein concludes that we will be judged, like all cultures, by the quality of our arts and artists, and by our willingness to allow their insights to influence our behavior.